‘ we visited his widowed mother…’; Tytler’s father died in Fearn in Angus, where he was the minister, on 29th July, 1785. He was buried in Fearn Abbey, Hill of Fearn, which is now in Highland Region. ‘ on to Glasgow, where John Mennons…’ Jeanie’s memory seems a little at fault here; The Glasgow Advertiser (now the Herald) began publication in 1783, with Mennons himself as editor. Unless, of course, she was referring to one or other of Mennons’ shorter lived publications, the Observer (which seems the most likely, and is listed in some summaries of Tytler’s works), or the Glasgow Magazine and Review. Mennons had been the publisher of the Weekly Mirror in Edinburgh, which Tytler edited. 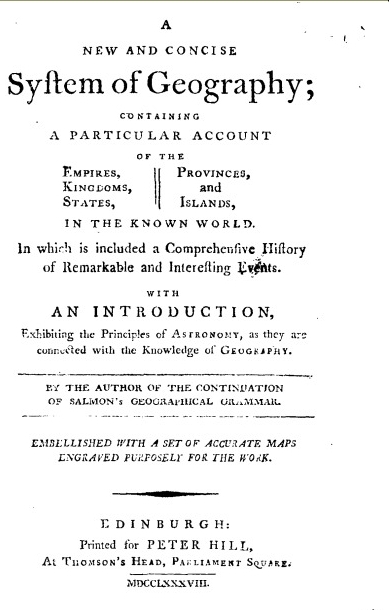 p. 229 ‘… there was also the matter of a revised edtion of Salmon’s Geography…’; The Wikipedia article for Salmon lists “A New Geographical and Historical Grammar, with a set of twenty-two Maps, London, 1749; 2nd ed. 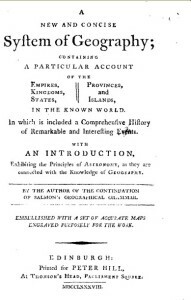 1751; 6th ed. 1758; other editions updated by J. Tytler, Edinburgh, 1778 and 1782; 13th ed. London, 1785.” and most lists of Tytler’s works agree that Tytler’s edition was published in 1782, so Jeannie’s memory seems to have failed her here. She has clearly confused that work with Tytler’s own Universal Geography, which was published in 1788. Peter Hill was an important publisher and bookseller in Edinburgh; he had been apprenticed to William Creech when Burns met him in 1787, and they formed a strong friendship. ‘…a summons for divorce…’; the records of the divorce procedure are available at the National Records office, as listed in ‘The Commissariot of Edinburgh – Consistorial Processes and Decreets‘. Tytler’s ‘defence’ was based on the fact that the original petetion did not give a provenance for Jean Aitkenhead. It was no more than a holding measure by his solicitor while he escaped Scotland. How and why Elizabeth was living in Hoy has never been explained.